Multi-address delivery makes the eCommerce shopping flexible and quick. Multi-address delivery is a very popular delivery feature that is being provided by the eCommerce sites across the globe. Here, the shoppers can place a single order with multiple products and select different delivery addresses for each of the products. It is a feature which is used by eCommerce giants like eBay and Amazon. The feature is being looked as a new way to secure some complicated yet most likely to convert customers. The sites having this feature are claiming some serious competitive advantages against the rival sites who do not have this feature yet. Gradually the feature is being looked as a must to have option for a better conversion optimization and improved shopping experience on eCommerce sites. Let’s have an insight of how “ Multi-address delivery” feature would help you to secure the conversions for your site. The feature is not being provided by most of the eCommerce sites yet. Since this feature requires a much-coordinated approach with the shipping partners, most of the eCommerce site owners are currently not able to implement it successfully. If you are able to add this option on your website it might provide you a unique selling proposition with a promise to the customers for a much flexible shipping facility. Most of the shoppers hate to fill the lengthy checkout forms. It becomes more resistible when shoppers might have an interest in multiple products but intend to deliver the products to different locations. In normal cases, the shoppers will have to place separate orders for each shipping address. Providing the Multi-address delivery will encourage such shoppers to avoid checking out again by placing different delivery locations in a single order. The main use of this feature would be for consignments containing gifts for multiple people or purchasing gift vouchers. You may want to use a different shipping address per product rather than placing a whole new order and checking ours again for each different shipping address. 1. After you start the checkout process, you get a choice that whether you want to select a multi-address delivery. 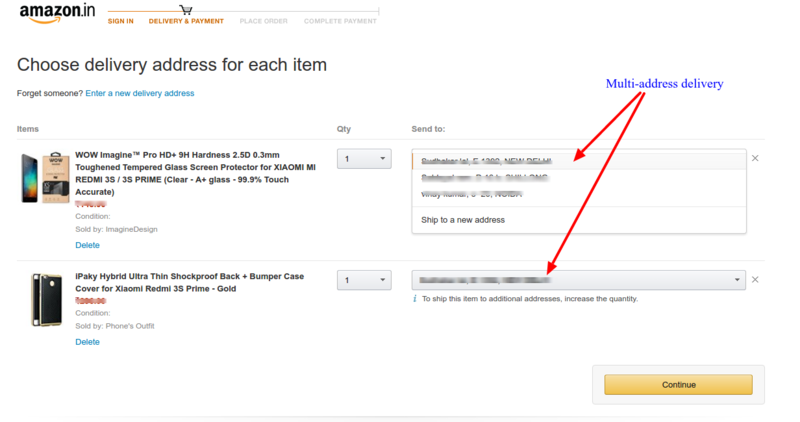 This feature will not be displayed to the customer if there is only a single product in the cart. 2. If the single option is chosen,the delivery will process as default checkout process. 3. If the multiple options is selected and you choose the multi-address delivery, the addresses already saved or an option to provide new address is shown against each product in the cart. 4. Either you can choose any of the delivery options from the saved ones or you can add a new address to the list. 5. If you choose from the already saved addresses, the order will be processed as per the next scheduled step. 6. If you want to add a new address then the form to fill up the new address will show. Fill up and save the address and continue with the normal checkout from the next step after confirming the shipping options. Just a small tweak in the normal checkout procedure can help you improve the conversion rates of your eCommerce site. Though this feature is still in research by most of the eCommerce sites, eBay and Amazon have implemented it, and are one of the early adopters of this new feature. The feature is more complex than it looks and it requires an expert level consultation to implement on your commercial site. Proper handling of delivery methods, Tax implementation, coordination between the delivery channels is some of the challenges you might face while implementing it. Remember that It is not just a software implementation but also requires a proper coordination in physical world. On the whole, it is not just a method of conversion optimization but also helps in preventing shopping cart abandonment.